My previous post on the altcoin bubble and Japanese investors has received some positive reactions but a few people pointed out the lack of concrete data and quantitative evidence. I think they have a fair point. My aim for the previous post was to provide an alternative view as to why many coins, especially certain altcoins, are experiencing significant price boosts recently. I didn’t provide much quantitative evidence because I assumed stats such as trading volume at Japanese exchanges would be publicly available and known to people outside Japan, however,it seems I was wrong. Much of the data at Japanese exchanges are not actually available, so I did a bit more digging myself and decided to provide additional evidence and estimates for Japanese investors’ market share in the global market. Coinmarketcap does not reflect the complete up-to-date stats and Japanese exchanges are mostly excluded from the list. Altcoin trading volume at coincheck is hidden in the Poloniex’s trading volume and the Polo’s seeming dominance can be misleading. The Japanese exchange Zaif alone would account for 10.5% of global XEM trading if properly listed on coinmarketcap. 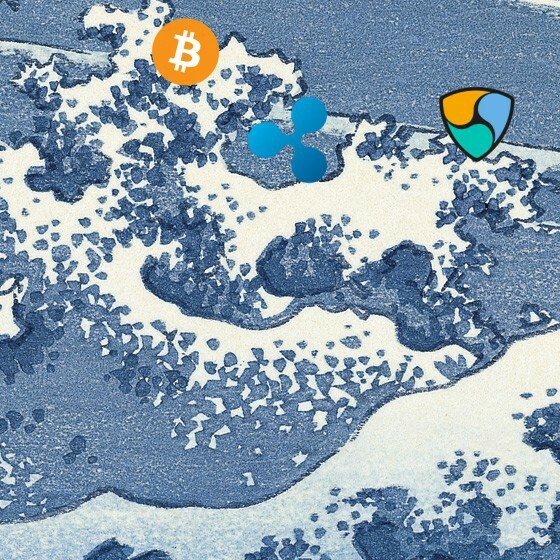 Based on my rough estimation, Japanese investors account for 35.2% of global XEM trading and likely more than 40% of global XRP trading. Japanese exchanges don’t have any significant altcoin trading volume? Looking at popular websites like coinmarketcap.com, there is no presence for Japanese exchanges or JPY trading in general for altcoins. Considering JPY having about 30% of total Bitcoin trading volume and many new Japanese investors hyping about altcoins on social media and more, the numbers don’t add up and something is very off. In short, the reason for the seeming absence in the global market is that Japanese exchanges don’t publish stats for altcoin trading and therefore, the true influence of the Japanese market is “hidden” on popular crypto analytics sites. I am going to explain why this is the case and also attempt to estimate the market shares of Japanese investors for XEM and XRP as a reference. Coinmarketcap suggests Poloniex is the dominant exchange for altcoin trading and while it’s probably true that Polo is still the largest altcoin exchange in the world, the numbers can be very misleading. As a matter of fact, Coincheck, the most popular exchange for altcoin trading in Japan, is merely a broker between Poloniex and Japanese investors, providing an interface for JPY trading and buying coins from Polo in the background. Thus, trading volume at coincheck is completely hidden and included in the Polo’s volume, further inflating Polo’s dominance on paper. Coincheck doesn’t publish any data for altcoin trading, so it’s not very clear how much of the Polo volume accounts for Japanese traders at coincheck but you should be aware that Polo’s dominant numbers don’t tell the entire story. Now, even though there is no public data for altcoin trading at coincheck, I’ll attempt to estimate the Japanese market shares for XEM and XRP based on the information I have gathered. Although coincheck doesn’t provide data for altcoin trading, Zaif, another prominent Japanese exchange, does and we can estimate coincheck’s trading volume from Zaif’s volume as well. Now I will try to estimate Japanese market share in the global market, based on the Zaif’s volume as well as some other info I have gathered. The result “feels” about right and is not far from my own observation of the community, so let’s assume Japanese investors’ trading volume is equally split between the three exchanges. XEM market share by Japanese investors in the global market would stand at 35.2%. Unfortunately, Zaif doesn’t list XRP, so I cannot employ the same strategy to estimate XRP trading volume by Japanese investors. However, assuming the Japanese XEM market share is 35.2% and taking account of popularity of XRP in Japan, I’d guess the Japanese market share for XRP would be even higher than that of XEM. I cannot really give an accurate estimation here but it should lie somewhere between 40% and 50%. Here are some takeaways from my additional research. The estimates I gave are rough, but they seem to support the theory of Japanese caused crypto bubble based on my observation. Coinmarketcap is a great resource but you shouldn’t count on it too much as the source of truth. Japanese exchanges should do a better job being more transparent and providing more data for the public’s sake in my opinion. So, here it is. I didn’t plan on doing this much research on this topic initially but I became very surprised how little people outside Japan understand about the market and how it’s quietly affecting the entire market at the same time. I hope my findings will help traders and enthusiasts understand the current landscape better and make more informed decisions.